Buy Open Source Democracy on AmazonBuy Open Source Democracyon BAM! The internet has become an integral part of our lives because it is interactive. That means people are senders of information, rather than simply passive receivers of ‘old’ media. Most importantly of all, we can talk to each other without gatekeepers or editors. This offers exciting possibilities for new social networks, which are enabled – but not determined – by digital technology. In the software industry, the open source movement emphasises collective cooperation over private ownership. This radical idea may provide the biggest challenge to the dominance of Microsoft. Open source enthusiasts have found a more efficient way of working by pooling their knowledge to encourage innovation. All this is happening at a time when participation in mainstream electoral politics is declining in many Western countries, including the US and Britain. Our democracies are increasingly resembling old media, with fewer real opportunities for interaction. What, asks Douglas Rushkoff in this original essay for Demos, would happen if the ‘source code’ of our democratic systems was opened up to the people they are meant to serve? ‘An open source model for participatory, bottom-up and emergent policy will force us to confront the issues of our time,’ he answers. That’s a profound thought at a time when governments are recognising the limits of centralised political institutions. The open source community recognises that solutions to problems emerge from the interaction and participation of lots of people, not by central planning. Rushkoff challenges us all to participate in the redesign of political institutions in a way which enables new solutions to social problems to emerge as the result of millions interactions. 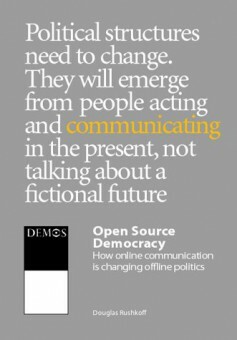 In this way, online communication may indeed be able to change offline politics.